BOEKENOOGEN WINES TASTING ROOM 24 W. Carmel Valley Road, Carmel Valley CA 93924 Open 11am-5pm daily • 831.659.4215 SANTA LUCIA HIGHLANDS VINEYARD AND WINERY 831.675.3549 Boekenoogenwines.com Santa Lucia Highlands Estate Pinot Noir voted as Monterey County's Best Local Red Wine 3 Years in a row! Santa Lucia Highlands Estate Pinot Noir voted as Monterey County's Best Local Red Wine 3 Years in a row! "2011 Boekenoogen Santa Lucia Highlands Estate Pinot Noir awarded 94 points and Editors Choice of Wine Enthusiast Magazine" "Boekenoogen 2012 Santa Lucia Highlands Estate Pinot Noir awarded Double Gold Medal and 96 points from San Francisco International Wine Competition and awarded 93 points from Wine Enthusiast Magazine" "Boekenoogen 2012 Santa Lucia Highlands Estate Chardonnay awarded 93 Points from Wine Enthusiast Magazine!" "Boekenoogen 2012 Carmel Valley Estate Viognier awarded 93 Points from Wine Enthusiast Magazine!" "Boekenoogen 2013 Garrett's Vineyard Dryland SLH Estate Pinot Noir awarded 93 points from Wine Enthusiast Magazine" "Boekenoogen 2013 Santa Lucia Highlands Estate 3 Clone Pinot Noir awarded 90 points from Wine Spectator!" "Boekenoogen 2013 Santa Lucia Highlands Estate Pinot Noir awarded 93 points from Wine Enthusiast Magazine" "Boekenoogen 2014 Santa Lucia Highlands Estate Chardonnay awarded 91 points from Wine Enthusiast Magazine!" "2011 Boekenoogen Santa Lucia Highlands Estate Pinot Noir awarded 94 points and Editors Choice of Wine Enthusiast Magazine" "Boekenoogen 2012 Santa Lucia Highlands Estate Pinot Noir awarded Double Gold Medal and 96 points from San Francisco International Wine Competition and awarded 93 points from Wine Enthusiast Magazine" "Boekenoogen 2012 Santa Lucia Highlands Estate Chardonnay awarded 93 Points from Wine Enthusiast Magazine!" "Boekenoogen 2012 Carmel Valley Estate Viognier awarded 93 Points from Wine Enthusiast Magazine!" "Boekenoogen 2013 Garrett's Vineyard Dryland SLH Estate Pinot Noir awarded 93 points from Wine Enthusiast Magazine" "Boekenoogen 2013 Santa Lucia Highlands Estate 3 Clone Pinot Noir awarded 90 points from Wine Spectator!" 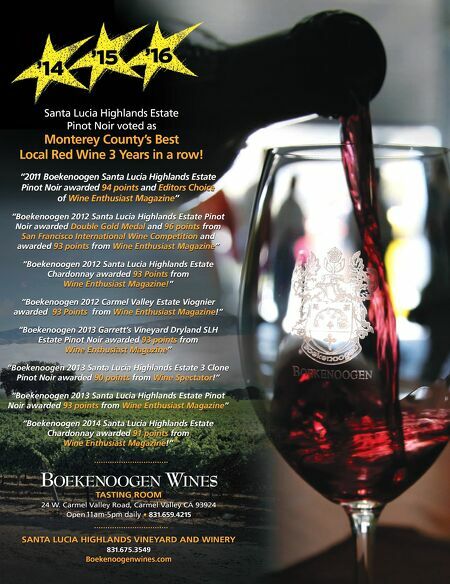 "Boekenoogen 2013 Santa Lucia Highlands Estate Pinot Noir awarded 93 points from Wine Enthusiast Magazine" "Boekenoogen 2014 Santa Lucia Highlands Estate Chardonnay awarded 91 points from Wine Enthusiast Magazine!"